A common and frustrating problem with computers is lost or deleted data that you actually want or need! It might be business documents that have been deleted due to mechanical faults, or lost family photos on your home laptop. Either way, PCHOME UK is the right choice for you when it comes to data recovery. We recover data from all types of hard drive with mechanical, electrical or file system problems. PCs, Laptops, Desktops, Servers, external hard drives and network storage devices can all suffer this problem, but we can also perform data recovery on any flash storage device, such as a USB stick or a digital camera card. The same process can be carried out for Apple products, if you are suffering from data loss due to technical faults with your iMac, MacBook or PowerBook. There are numerous versions of each device, but not matter the generation of your Apple product, PCHOME UK has the knowledge and experience to carry out professional data recovery. 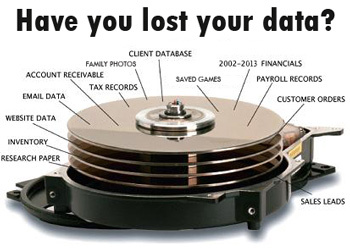 Data recovery is an intricate and often risky procedure, so you should certainly leave it in the hands of professionals. If you suspect your equipment of being faulty and losing data, or you have accidentally deleted files you want, we strongly recommend you switch off your device immediately. This increases the chances of the data being recovered. With some devices, we will need you to bring us the device along with an external hard drive to recover the data to. Recovering data is a difficult and time consuming process, and customers’ circumstances differ greatly; therefore, it may be difficult to predict how long each job may take.